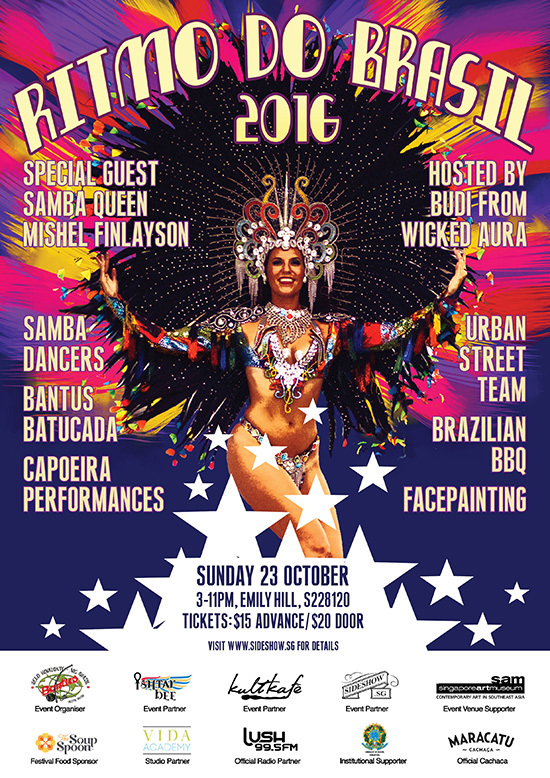 Ritmo do Brasil 2016 – A Brazilian Carnival Cultural festival at Kult Kafe! Ritmo do Brasil is back bigger and better than ever! Hosted by Budi (Wicked Aura), the event features an awesome line-up of Brazilian entertainment with guest artists from around the world: Samba Queen Mishel Finlayson (Sambaliscious, Brisbane), Capoeiristas from Brazil, Australia, Indonesia and Malaysia and the nimble, fleet-footed football freestylers from the Urban Street Team. And of course, no Brazilian Festival is complete without the sensual Samba Dancers from SambahLah! and SambaBomBom! with the groovy Bantus Batucada band. As you enjoy the entertainment, kick up your feet and sip a refreshing Caipirinha to accompany a plate of mouthwatering Brazilian BBQ. Continue to groove the night away with DJs from Sideshow spinning Brazilian favourites, favela funk, Samba, Forro and more! Venue: Kult Kafe @ 11 Upper Wilkie Road, Emily Hill.